In Chinese, we do not say “one cat” or “two fish” as “一猫”，“二鱼”. When referring to the quantity of an item, there is always a ‘counter word’ involved. I use the term ‘counter’ for lack of better translation because there is no equivalent in English. This is what was used in my Japanese Language textbook, so I just borrowed the term. Yes, in the Korean and Japanese language, there is also the use of such counters. The most common counter word is the word ‘个’ (gè) and it can be used for a lot of things, e.g. one person is 一个人, one word is 一个字. Incidentally, when counting the quantity 2, we do not say 二个, but 两个(liǎng gè). 二 is usually used to refer to the number 2 and not quantity 2, although once in a while, you may come across sayings like “一石二鸟” (to kill two birds with one stone) or “二者不可兼得” (you can’t have both at the same time). It is not very easy to learn 量词 because although there are some general rules of thumb, you basically have to remember which one to use with what. And there are so many of them. Some of them are easy enough to figure out. Like ‘a bottle of water’ is 一瓶水. 瓶 is bottle, so you say one bottle of water like in English because you cannot count water itself. Some rules are rather arbitrary. E.g. 头 is generally use for large animal like 1 cow is 一头牛 vs 1 rat which is 一只老鼠. However, 1 tiger is still 一只老虎. Sometimes, for the same thing, depending on how the thing is presented, what form of it you are referring to, the counter would be different. E.g. a bundle of rope would be 一捆绳子 but one rope is 一根绳子 or even 一条绳子. 1 flower alone is 一朵花 but a bouquet would be 一束花. One strand of hair is 一根头发 but if you hold up a handful of it, it would be 一把头发, and if you want to say someone has long hair, you may say that person has 一头长发. To confuse things further, although officially there is supposed to be a standardised use of counters, the actual use of counters can vary from region to region, very much influenced by the regional dialect. For instance, a Cantonese would think there is nothing wrong with 一只鸡蛋 (1 egg) but a Northerner may take issue with that and insist the “right” way of saying it should be 一粒鸡蛋. In general, as long as you do not use the far wrong counter, it can be understood and accepted. E.g. 一个苹果 or 一粒苹果 both are acceptable. But 一张苹果 (one sheet of apple) would be outright wrong. Counters are not just used with physical things for the purpose of counting. They are also used with abstract nouns. It is not just used with quantities but with demonstratives as well. E.g. 一个愿望 – (my) one wish; 这个愿望 – this wish (of mine). If you are bewildered by now, I really do not blame you because this IS a very confusing part of the language, so much so that children have to be specially taught the right way to count the common things. I can only say that the more exposure you have, the more familiar you will get with this. So listen and read more. 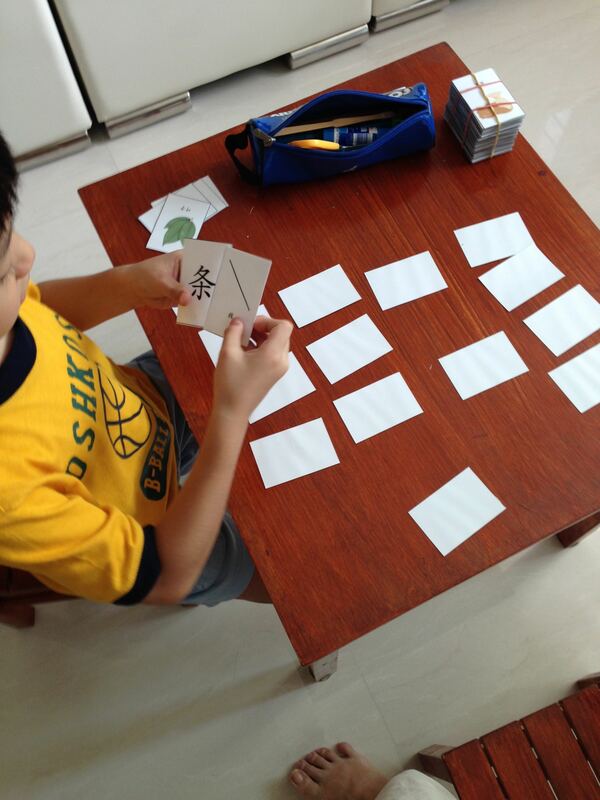 I have created a set of Chinese 量词 card game to help my kids in the learning of Chinese counters. In Chinese, there are many counters. The Xinhua dictionary lists 286 of them!! Fortunately, the commonly used ones are not that many. Those included in the cards are a few of the more common ones. I tried to include the ones that a school kid will likely to use or encounter. 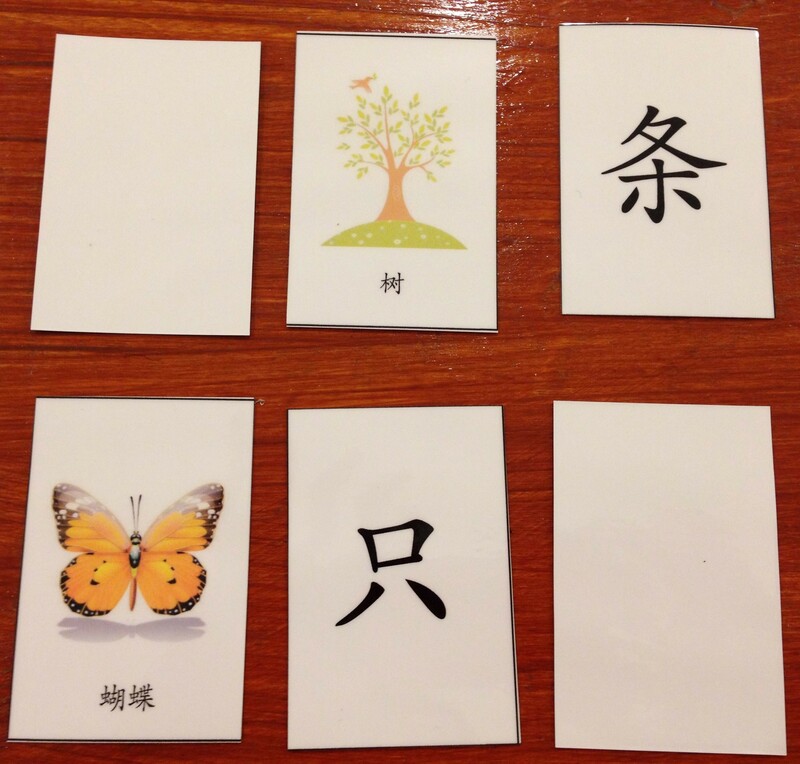 In our Primary 2 Chinese textbook, there is one lesson on counting things, and the things listed in the lesson are included in this set of cards. 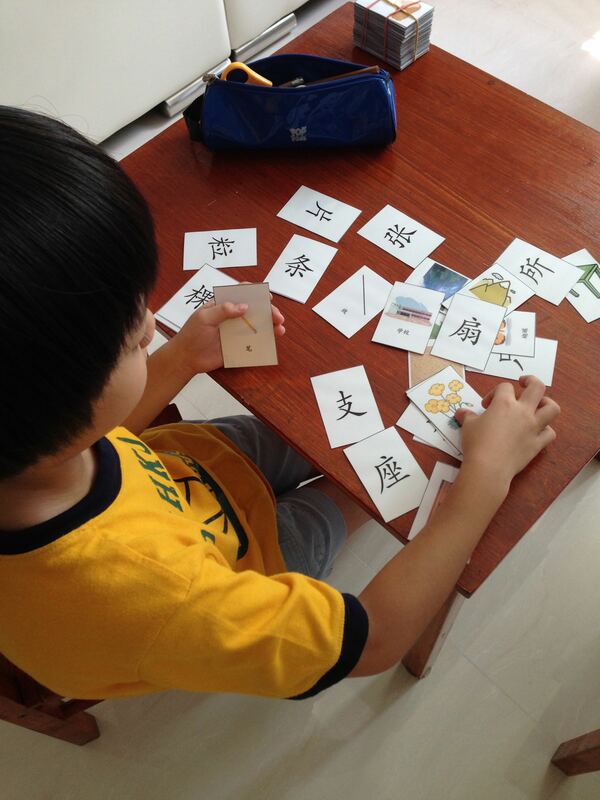 The template for the cards is made such that the counter corresponds with the noun it is used with. I strongly recommend that before you cut up the individual cards, you make some kind of marking at the back of the cards so that you know which matches with which, because once they are cut up and mixed up, it would be impossible for you to know the correct match unless you are a native speaker. I have included an Answer Key for reference but it would be slow to keep having to refer to it. There are 17 pages of the cards, each with 5 pairs, so that is really quite a lot. You may want to just take out a few at a time for playing or teaching. When I used the cards with my preschooler last time, I only used 5 pairs at one time. Thank you for this game! I can use this for both the K1 kid as well as the P5-going-to-P6 one if I separate the easier/common ones from the less common ones. Indeed, this one can be used to P6 because there will be the uncommon ones that will stumble an older student.